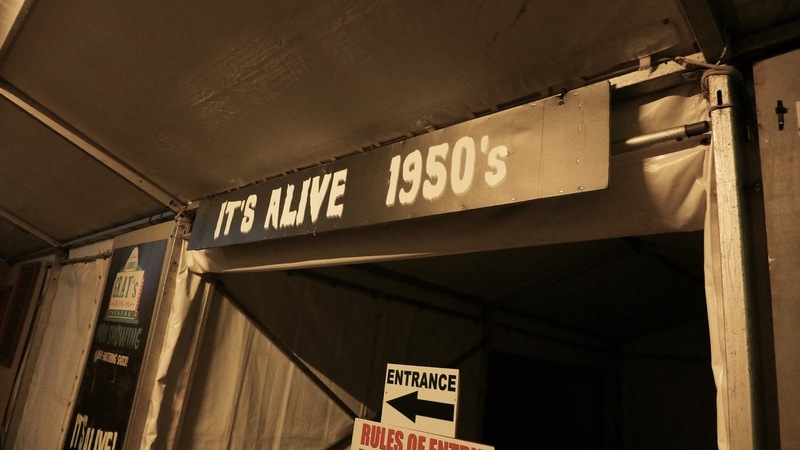 A whole horror event themed to the horror genre through the decades?! Errm, hell yes. Ever since I heard about this event I was absolutely gagging to get to Dr. Fright's Halloween Nights presents CINEMASSACRE. 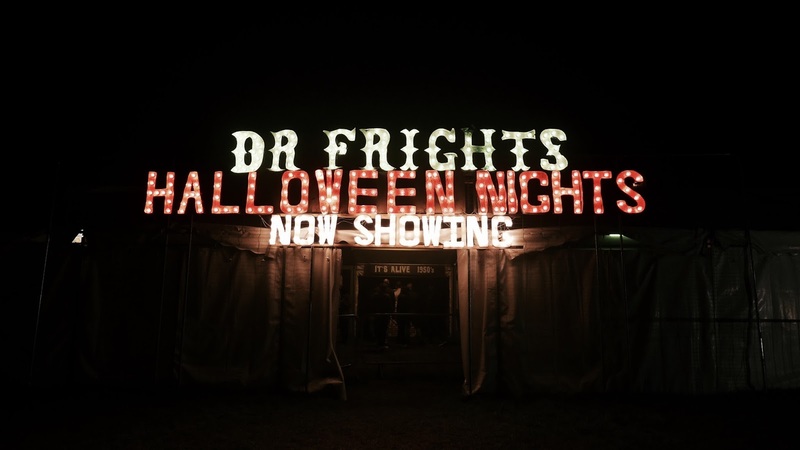 The event was the winner of the Scar Award for UK's Best Halloween Scream Park 2015 so it must be good right? Errm, well, kind of. The premise is EXCELLENT. 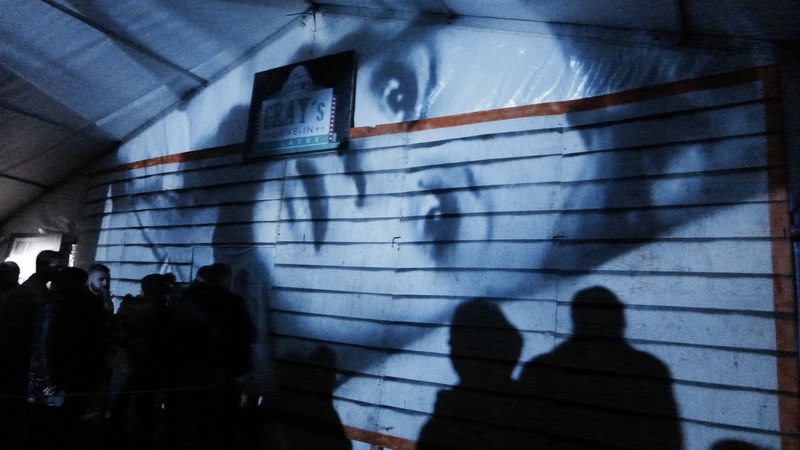 Essentially you travel through the silver screen through the 50s, 70s, 80s and present day. Each maze has a cinema/film themed facade fly postered with movie imagery of that time and pumps out music from the accompanying era. Atmosphere-wise it really sets the scene for each individual theme and I was really eager to sink my teeth into some real old school horror movie goodness. Luckily the kitschy B-Movie lightning effect strobe meant the jump scares were actually quite effective but the set and costumes really did let down what was set up to be a really high quality attraction. 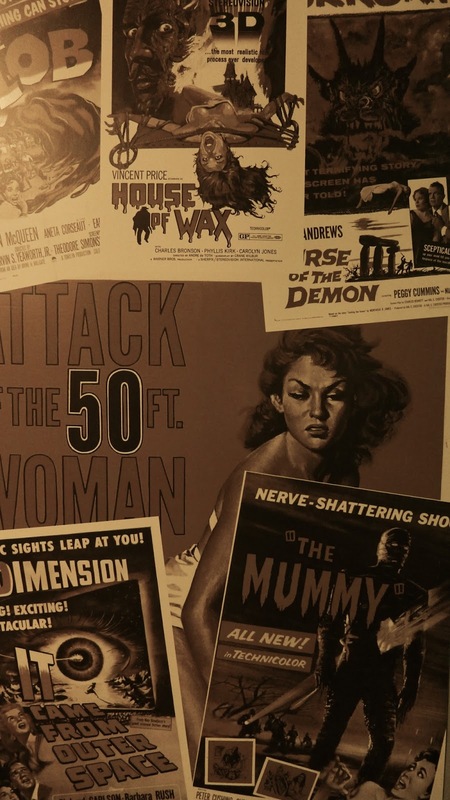 A horror maze themed to some grindhouse exploitation cinema sounds like an idea plucked from my brain itself, and again queuing up surrounded by posters of my favourite films of all times whilst 70s rock blared out of the stereo had me all kinds of excited. 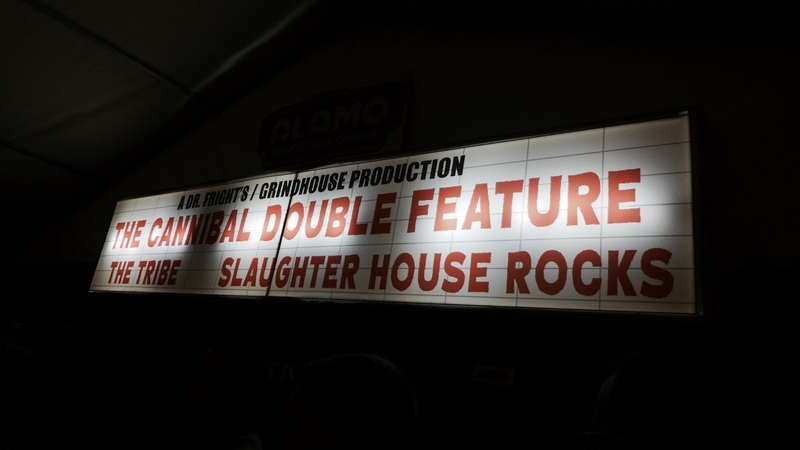 Playing on the double-feature trend of 70s grindhouse cinema this attraction crammed two themes into one. The first is giving Cannibal Holocaust vibes as we wander into the territory of a flesh eating tribe. Whilst the make-up and costuming had improved in this one, annoyingly the sets were even worse than the first maze and it was becoming very apparent that bursting out of hidy holes and yelling was to be the scare offering of the evening. And it was becoming old pretty fast. The second half of this video nasty double-feature was definitely the better half. OK, so mainly this was because this attraction was wall to wall beardy hunks covered in blood, but also because the sets suddenly came to life, the soundtrack was upbeat and pounding and the actors really felt crazy. 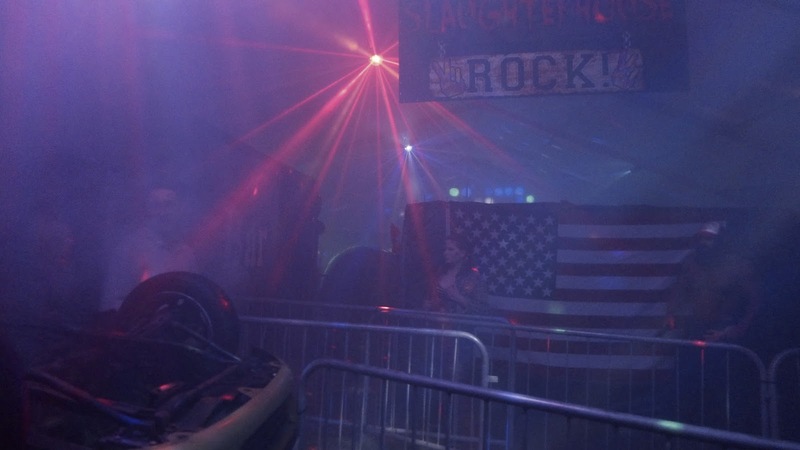 Themed to a rock festival run by rednecks where even the band want you dead, this was totally fun, chainsaw grinding madness and easily my fav maze of the night. Fast forward to the 1980s and the age of the rentable VHS. 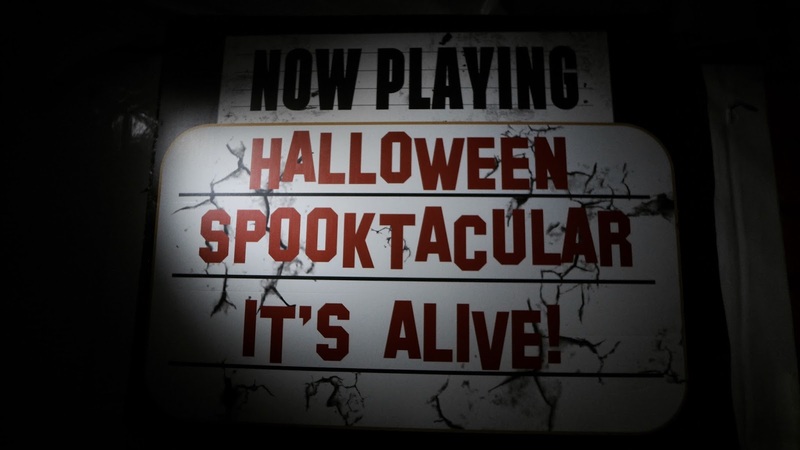 We wound of way through the queue into the video store surrounded by 80s slasher film posters and humming along to the sounds of Michael Jackson, I again found myself grinning with excitement. This really is my theme of dreams! The facade for this one was back to the level of the 1950s maze from earlier with a creepy cabin in the woods, flickering light complete with creaking porch bench. The theming here is probably the best of all of the mazes, but then I guess 'creepy house' isn't that hard to recreate! Sadly the scares here were more of the same 'pop up and yell' type, which were by now becoming incredibly tiresome. The upside of this maze is that half way through we're treated to a shoutout to the VHS era and the maze 'rewinds' meaning we go through the whole thing again. This is a really cool touch and shows that the creators of Dr. Fright's aren't without creative flair and that it's probably more of a budgetary issue. 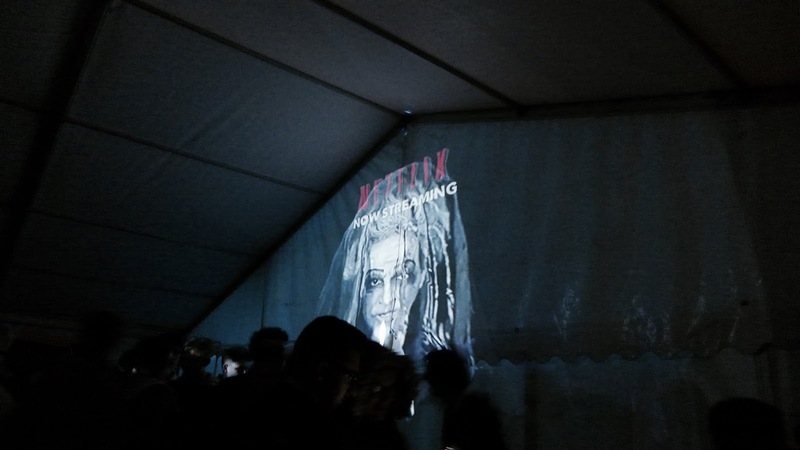 Playing on the modern day horror obsession with haunting and possession storylines, the 2010s section focusses on our shift into watching more horror via download or apps like Netflix. 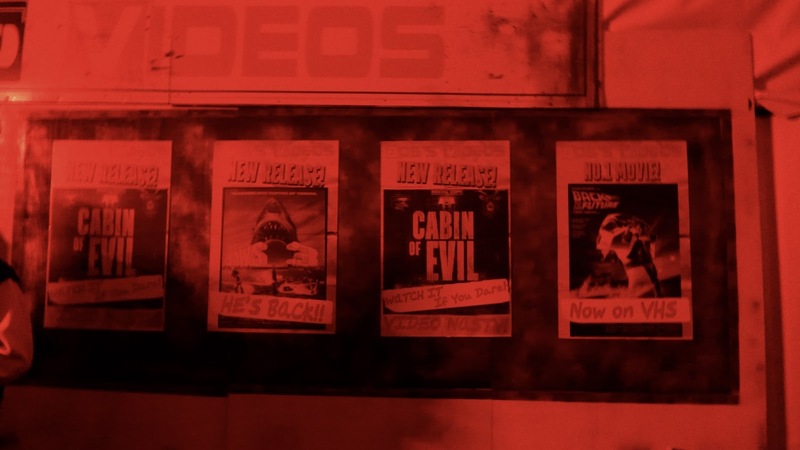 Again, with a modern soundtrack playing through a podcast and surrounded with contemporary movie posters, we enter the virtual world of downloaded film and straight into a narrative inspired by the likes of Scott Derrickson or James Wan. The theming here was better in some ways but the fact that I could feel the grass beneath my feet kind of ruined the illusion for me. Also, whereas I could kind of forgive the 'jump and boo' style scares in the previous mazes, I feel like ghost/haunt narratives require a little more creativity than that. Trickery and mind games would have worked so much better here so I couldn't help but feeling a little disappointed with this one. I'm glad I finally discovered what Dr.Fright's had in store for me as I've always adored the idea of this event but it's definitely not one I would rush back to. The team behind this event are clearly very inventive and creative people restricted by budget, but that said I feel like a little more variety with performance could go a long way.